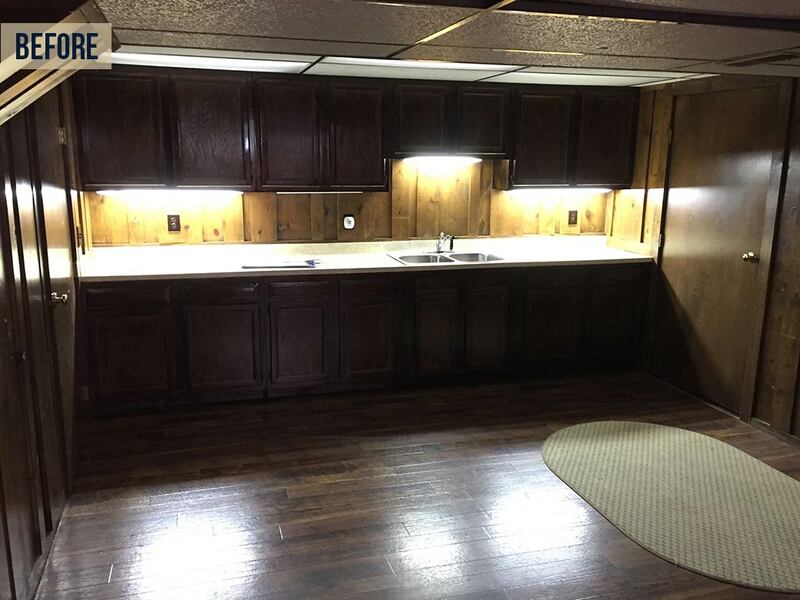 The existing basement had a kitchenette, but was otherwise a blank slate for the remodel. The design's only real obstacle was the position of the support columns throughout the space. To work those into the plan, the basement was carved out into zones so that each column could be incorporated into an element, or feel a bit like a doorway between spaces. This created a great scheme for adjusting the feel of each area a bit to round out the entire theme. All the woods throughout are stained dark to create the deep mood. In some zones, the effect feels rustic and straight out of the country. In other areas, with a change in lighting and furnishings, the rich wood recalls the grandeur of a country mansion. 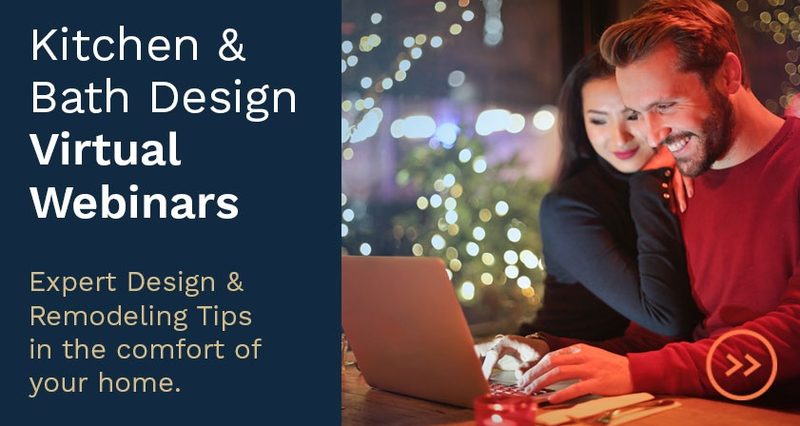 The room trades off between these two attitudes, rather than using them both throughout, so that the design doesn't feel muddied by too many themes at once. 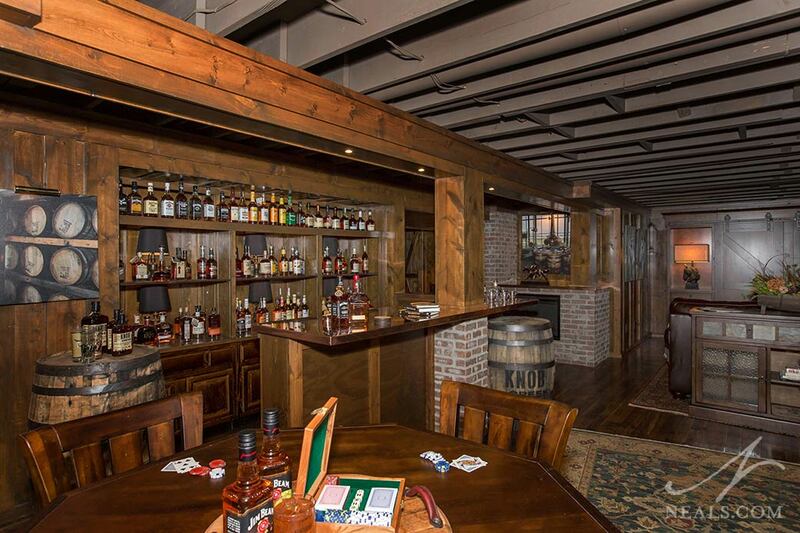 The central feature in the remodeled basement is a bourbon bar, showing off the homeowners' large collection. 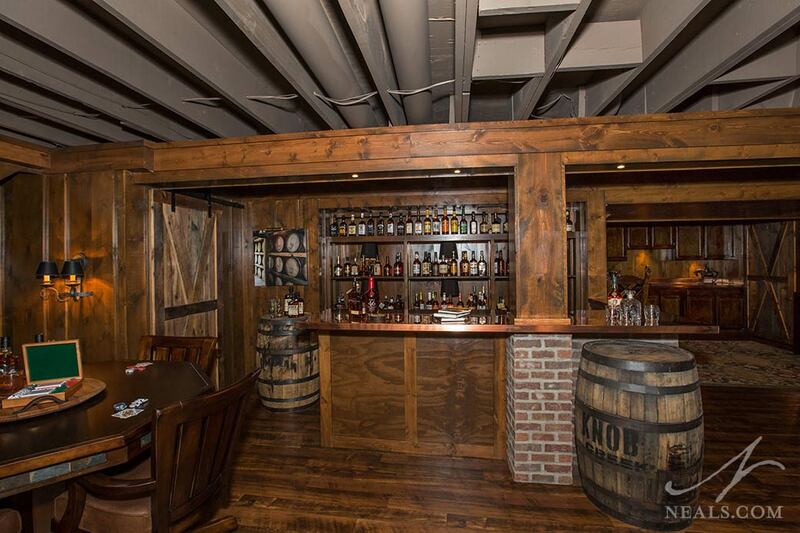 The bar was designed with the feeling of a put-together western saloon, complete with bourbon barrels, and brick details. In front of it a traditional card table awaits the next hand. Around the corner, the kitchenette was updated to reflect the new style. 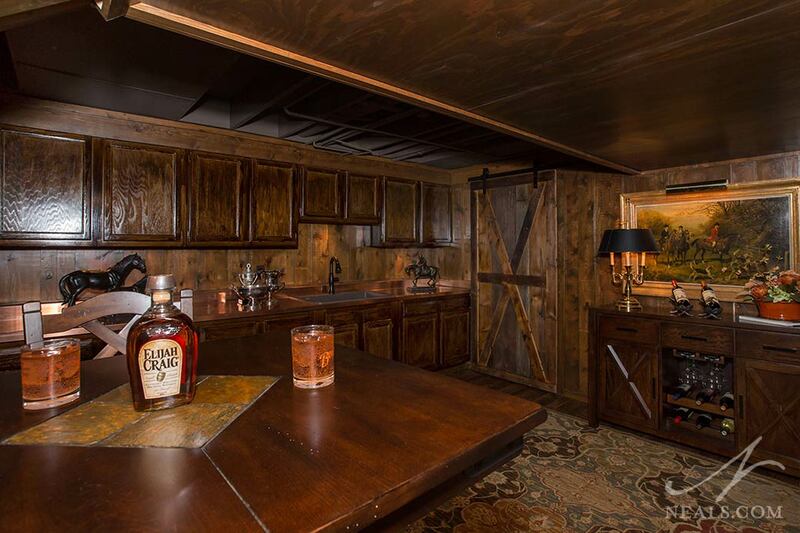 Here, the feeling is more like a well-appointed jockey's lounge. 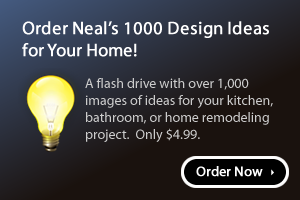 Rooms off the kitchen are accessed via a pair of barn doors. One of these is a powder room that sports a classy copper counter and hammered copper vessel bowl sink. Back in the main room, a den is situated at the end of the space. 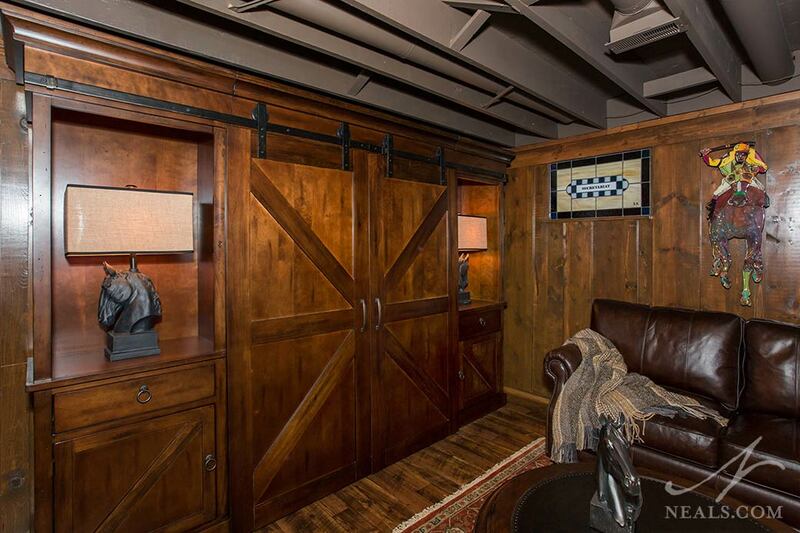 Here again, barn doors are used to switch from sitting area to TV room. With the accompanying built-ins, the space is another traditionally designed portion of the room that invited relaxing and long conversation. 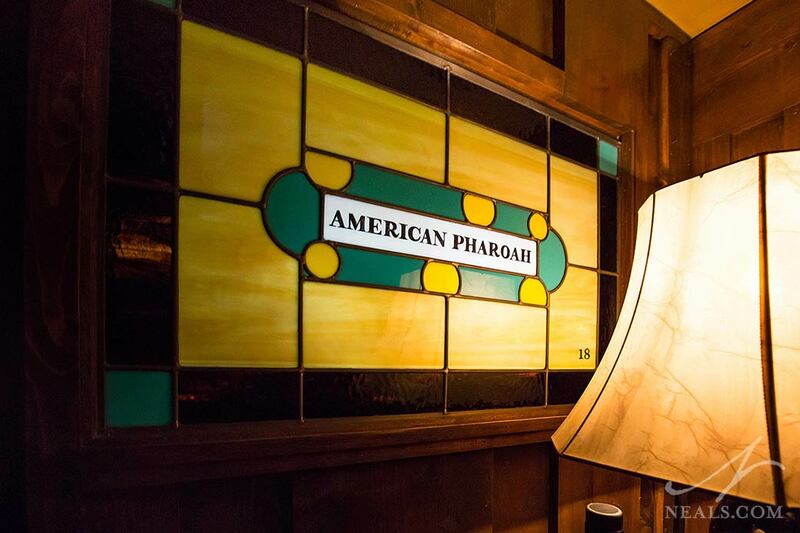 The basement is rounded out by a tribute to horse racing. Stained glass window panes celebrating past champion horses, and a different stable-style barn door over the closet decorate the area near the stairs.